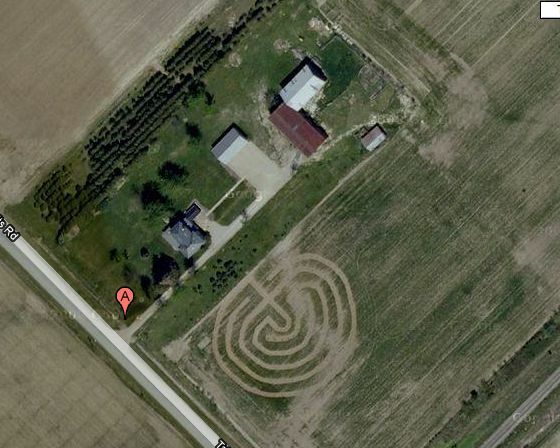 John Ridder,<jridder@paxworks.com> labyrinth designer, says “there have been a few [labyrinth] quilts made over the years, although I dont know if they have been offered in a pattern. Attached is a photo of the quilt auctioned off at the 2010 TLS Gathering in New Harmony. The blocks were all the same pattern, simply arranged differently. Block was designed by Ben Nicholson. www.paxworks.com Labyrinth designer & consultant, gallery and articles. www.labyrinthshop.com – Personal Labyrinth products – on-line ordering! Posted on May 2, 2011, in Barn Quilt Champions., Quilt block patterns. and tagged classical labyrinth, John Ridder, labyrinth quilt design. Bookmark the permalink. 1 Comment. Barn Quilts are popular in Iowa, too. This is a lovely idea a cloth quilt for a bed or sofa.